Leave a comment here to be in with a chance of winning this digi tulip for free. You have until Sunday night. :) Jane's so generous with her digi stamps. Your cards are always so perfect! Such a neat idea with the lined paper! It reminds me of gorgeous doodling! Lucy...love, love, love your card with the lined paper - perfect! Thanks for the chance to win! Love that lined paper too - though I guess that's the teacher in me too! Love your card and the tulips on the lined paper, so unusual and brilliant. LOVE this Lucy!! You rocked these Tulips...Love them on the lined paper!! You know I'm crazy over your lined paper since the first time I saw you use it. Thanks so much for providing the link. I can't wait to make my first purchase. Your card is marvelous! Super card, lovely colours and beautiful stylised tulips! Lovely to see the tulips in their full glory before they begin to droop! Love this card Lucy and I love this stamp too, thanks for sharing with us your great inspiration!! Awesome card! 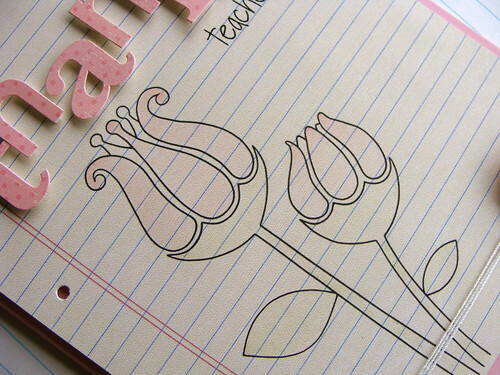 That tulip image is great, just perfect with the lined paper and pink card. You are so talented. The image and combination of paper, etc is just so 'on'. Love what you did with the image - great design! Thanks for the chance to win - be sure to stop by and check out my giveaway as well! What an AWESOME card, perfect for a teacher! OMGoodness!! EVERYTHING in this card is perfect!! LOVE IT!! Lucy, very funny blog today :o) You certainly do deserve that card, for yourself. I love the subtle touch of colour you have given the flower too. I have my fingers crossed to win, if not I will heading straight over to Jane's Doodles to purchase it. Beautiful card. This is a gorgeous card. TFS. This is lovely! I love everything about it, but esp. the background lined paper and doodle! Lovely card! Especially how you've done the tulips on the lined paper, fab!! Such a soft and sweet card. Lovely, really lovely. That's a great card, so clean and simple. The tulip could be used for so many other occasions too! Beautiful card, Lucy! Love the doodle idea on note paper! Oh my goodness, love how soft and sweet this is! That notebook paper is gorgeous! Sweet and Prefect :) Love the lined paper! Love the card. You could send it to one of your former teachers. Great tulip stamp. Thanks for the chance to win it. so soft and pretty! love the lined/text paper and your soft coloring!! What a beauty! I think the colors are so soft and pretty, and putting the image on the ruled paper was ingenious! The bottom edge just rocks it out to the max!!!! Love it - great image, too! Fabulous idea! I totally love this Lucy! HI Lucy, lovely card as usual, my son has always had a bad habit of doodling when the teacher is talking - he is 14 and still does it I think! It is not all bad, I must say he is very artistic. Thanks for a chance to win. Such a great card. The doodle is wonderful! Thanks for the giveaway....just to let u know, i just made my first hybrid card...thanks to your blog. really inspiring. This is so soft and pretty. Beautiful flowers. 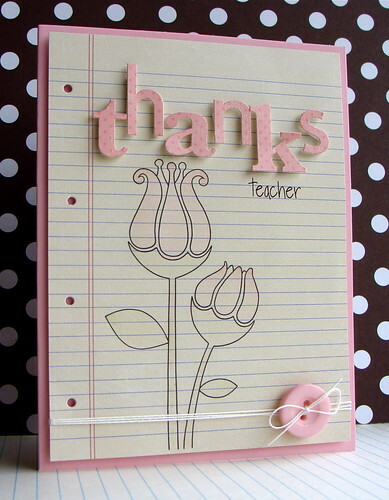 If you wrote "for everything" OR "so much" on a paper and cut it out, you could put it over the name "teacher" and have a perfectly wonderful thank you card for any occasion. Thanks for sharing. Oh Lucy, this is a knock out... definitely send it to yourself. Stunning. Love everything about this card! Thanks for the inspiration. I'm a doodler and it helps me concentrate on the lesson! This card is perfect!